Going down the street for a sushi roll during my lunch break is a favorite pastime of mine. I would run down the stairs and around the corner to be braced with many food options while aiming to spend $3 max a day – there would be dim sum, asian bakeries and even my favourite, banh bot loc! 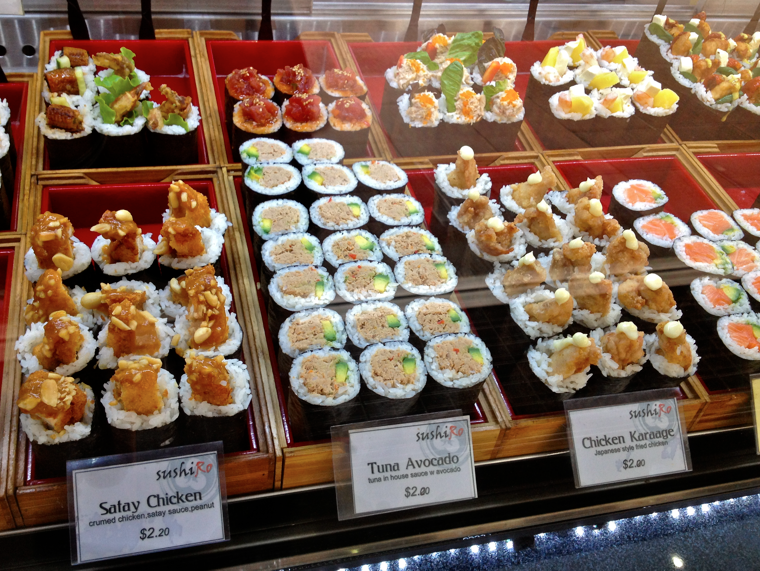 The sushi shop down the street was my favourite treat. $2.20 for a tuna roll with avocado, or $2.80 for a salmon roll with avocado (if I’m looking to really treat myself). Simple and cheap eats which seemed luxurious to me at this time – today it’s hard to find myself satisfied under $7. Moving here, it was peculiar to me that jumbo sushi rolls were never sold in Toronto, right next to my wonder of why there are no abundant number of sushi trains. 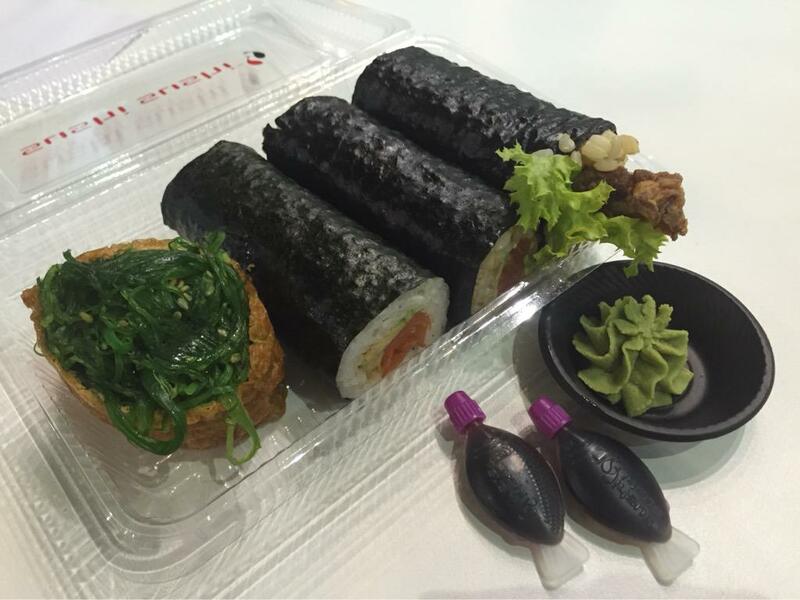 The memory of unveiling the plastic wrap around the tight-knit sushi roll… One and a half of these would be the perfect size lunch – an inch and a half across and 3 inches long. Each one would come with a fish=shaped soy sauce container which was darling to squeeze along the way and ensuring each bite was a soy sauce tainted one. Fast forward, and it’s been so long since I’ve had a satisfying charmer like that. Sushi Burritos have made their way across Toronto, and I don’t see any stopping. With Edo Sushi first rolling out theirs at FNLROM (pun intended), then Sushitto really building the hype as people chase after their sprawling food truck…and finally, we have Rolltation. Rolltation is location on Dundas Street West, just East of St Patrick station. They sell customizable rolls in either a bowl or a burrito. With the bowl, you have an option of brown rice. Open at 11AM, there’s already lines forming, but the wait is not too long (…if you are the 3rd person in line). I already had my list ready of what I was to order. The first fella you talk to asks for your name, your chosen protein and whether you want it in a bowl or a rice wrap. A sheet is laid into a machine, and out it rolls with a perfectly distributed layer of rice. Impressive. Can you guess which one was the winner? Very surprisingly, the red onion one was a pleasure. The sweet texture of the seaweed, combined with the soft avocado + salmon and crunch of red onion was glorious. The lettuce, I could definitely do without. But, I’m talking generosity as each topping was measured to give you your true money’s worth. With each roll the fellas were wrapping up, it was a wonder that they finally got it all in without breaking it! My favourite part of these customizable rolls were the “crunch” options. I got fried lotus root and they were phenomenal. The rolls were $14.99 each, but honestly, it’s much better to share. after half and literally one bite, I felt way too full. Delicious rolls, I will be back with that same order!